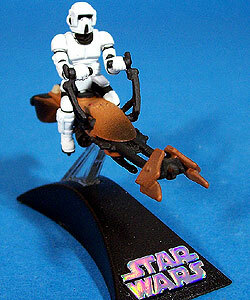 Comments: Imperial scout troopers use speeder bikes to navigate dangerous forest terrains. One bad move on these single-person repulsorlift vehicles, and you’ll end up as tree plaster! These advanced speeders are equipped with directional steering vanes, toggle switches for communications and shoulder-level handgrips, all of which aid in exceptional speed and maneuverability.